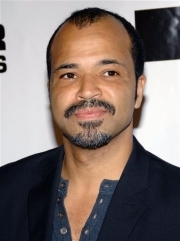 Jeffrey Wright is an American film, television, and stage actor and film producer. Wright was born in Washington, D.C. to a mother who worked as a customs lawyer and a father who died when he was a child. He graduated from St Albans School and attended Amherst College, receiving a bachelor's degree in political science and planning to continue on to law school; however, he decided to study acting instead. After attending New York University for two months, he decided to leave and became a full time actor. Wright began appearing off-Broadway in New York City and Washington, D.C., and in 1990, he appeared in his first major film as an attorney in Presumed Innocent, which starred Harrison Ford. In 1991, Wright joined John Houseman's national touring repertory company The Acting Company with productions of A Midsummer Night's Dream and Athol Fugard's Blood Knot. Wright continued with his stage performances and in 1994 was cast as Norman 'Belize' Arriaga in Tony Kushner's award-winning play Angels in America. His portrayal of a gay nurse forced to take care of the homophobic Roy Cohn as he lay dying from AIDS won him the Tony Award for Best Featured Actor in a Play. In 1996, Wright had another breakthrough performance on the big screen, portraying painter Jean-Michel Basquiat in the film Basquiat. Wright's performance was again critically acclaimed and the movie gave him the chance to work alongside veterans such as Gary Oldman, Willem Dafoe, Dennis Hopper, David Bowie, and Christopher Walken. Throughout the 1990s and early 2000s Wright appeared in both leading and supporting roles in such films as Woody Allen's Celebrity , Ang Lee's Ride with the Devil , Shaft , and Boycott , where he gave an AFI Award-winning performance as Martin Luther King, Jr. In 2003 Wright reprised his role as Norman 'Belize' Arriaga in HBO's award-winning adaptation of Angels in America starring alongside screen veterans Al Pacino, Emma Thompson and Meryl Streep and directed by Mike Nichols. His performance garnered him an Emmy award as well as a Golden Globe award for Best Supporting Actor in a Miniseries. In 2004, he appeared in Jonathan Demme's remake of The Manchurian Candidate opposite Denzel Washington, Meryl Streep, and Liev Schreiber. In February 2005, Wright returned to HBO Films in his friend George C. Wolfe's directorial debut, Lackawanna Blues, which starred many notable African-American actors. He also guest starred on The Young Indiana Jones Chronicles and Homicide: Life on the Street. Among his most notable film roles was the Washington attorney Bennett Holiday in Stephen Gaghan's Syriana , where he was the co-lead along with George Clooney and Matt Damon. The same year he played Bill Murray's eccentric Ethiopian neighbor Winston in Jim Jarmusch's existential road movie, Broken Flowers. In 2005, he starred in the play This Is How It Goes, alongside Ben Stiller and Amanda Peet. He also appeared as one of the tenants in M. Night Shyamalan's Lady in the Water. In 2006, Wright featured as Felix Leiter in the 21st James Bond movie, Casino Royale. This makes him the first African-American to play the character in an official Bond film . He reprised the role in Quantum of Solace, making him the second actor to appear as Leiter twice since David Hedison played the character in Live and Let Die and Licence to Kill, and the first to play him in consecutive films. In 2007, Wright was reunited with Casino Royale co-star Daniel Craig for the alien invasion suspense thriller, The Invasion, with Nicole Kidman. In 2008, Wright portrayed George W. Bush's former Secretary of State Colin Powell in Oliver Stone's biographical film W. Also, Wright portrays Muddy Waters in Cadillac Records, a biopic about the rise and fall of Chess Records. In 2010 Wright originated the role of the titular character, Jacques Cornet, in the world premiere run of John Guare's A Free Man of Color at the Vivian Beaumont Theater of the Lincoln Center for Performing Arts in New York CIty. Wright married actress Carmen Ejogo in August 2000. They have a son named Elijah and live in Brooklyn, New York. In 2004, Wright received an honorary degree from his alma mater, Amherst College. On July 12, 2008, Wright was arrested, along with actor Josh Brolin and five other crew members of W., after an altercation at the Stray Cat Bar in Shreveport, Louisiana. Charges against all seven men were later dropped by Shreveport prosecutors. Whole or part of the information contained in this card come from the Wikipedia article "Jeffrey Wright (actor)", licensed under CC-BY-SA full list of contributors here.